Many brides want their most noticeable attributes on their wedding day to be their smiles, the sparkle in their eyes, or their overall appearance. For many, a modest wedding dress is essential when it comes to creating a look that isn't distracting for the wrong reasons. Beautifully Modest is a company that offers a very large assortment of modest wedding dresses, or in other words, wedding gowns that don't show too much skin. The website photo gallery displays many types of wedding dresses with sleeves, cap sleeves, and plenty of so-called "modesty panels" over the chest and back shoulders. The designs do not sacrifice beauty for modest. A visit to the site will reveal first-rate elegance, with lace overlays, bead work, lace trains and other fine embellishments. 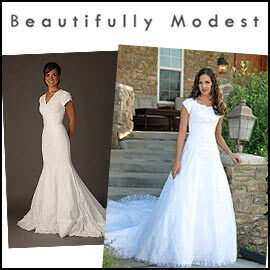 Styles include sheath cut gowns, princess cut gowns, ball gowns and more. The website offers many pages of dress designs, and the company also carries prom dresses, day dresses, bridesmaid dresses, mother-of-the-bride dresses, semi-formal dresses, accessories (slips, shoes, etc.) and more.